Statesboro, Ga. (Oct. 3, 2017) - Monument Real Estate Services, one of the country's most skilled asset and property managers, announced today the launch of its student housing division with the acquisition of the firm's first student housing management assignment The Vault at Statesboro in Statesboro, Georgia. 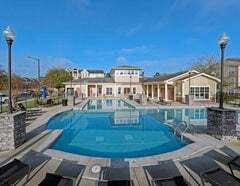 Formerly known as Campus Evolution Villages, the 528-bed, four-story student living community initiates Monument Real Estate Services' student housing division, which will focus on catering to student needs in housing in these niche properties throughout several markets nationwide. Monument's student housing division will meet the rapidly increasing demand in the sector, as enrollment in postsecondary institutions is expected to increase 14 percent to 23 million by 2024, according to the National Center for Educational Statistics. Coupled with Generation Z entering college-age years, demand for student housing is expected to remain robust. We are very pleased to further our offerings with the launch of our student housing division, and The Vault at Statesboro is an excellent property to diversify Monument's portfolio, said Jaime Rauscher, COO of Monument Real Estate Services. The decision to expand into this burgeoning real estate sector was very clear due to the increasing demand of all housing types surrounding higher education institutions. We look forward to serving this demand with an excellent team of in-house professionals equipped to address the unique needs of the sector. Located at 1699 Statesboro Place Circle, The Vault at Statesboro is comprised of fully furnished four-bedroom units with private balconies. Additional features include chef-inspired kitchens, in-home laundry and cable/satellite. As part of the firm's comprehensive management services, a number of interior and exterior upgrades will be implemented to enhance the property's features, including new appliances and furniture, as well as a private study area and fitness center with virtual on demand classes. A pool deck with fire pit, built-in grills, cabanas and hammocks will also be added. The Vault at Statesboro also features free Wi-Fi, a clubhouse, various tennis courts, swimming pool, game room and stand-up tanning bed. Conveniently situated near Veterans Memorial Parkway, The Vault at Statesboro is a few minutes from downtown Statesboro, and is a short walk from Georgia Southern University. This new management assignment will enhance Monument's scope of services with a dynamic property in a strategic location, said Lisa Davis, regional manager for MRES. We look forward to expanding the student housing division with additional communities within the next year. For more information, please visit https://www.mresmgmt.com/ or https://www.thevaultatstatesboro.com/.